One very large -- and one very small -- Chinese company make our list. Even the Great Wall couldn't prevent a market meltdown from reaching Shanghai. Investors in the Middle Kingdom have seen better days. 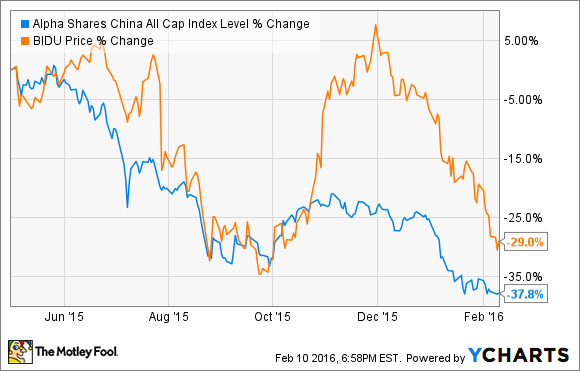 Between last June and today, the Shanghai Composite Index has lost nearly 45% of its value. Even though that only includes companies that are publicly listed in China, it hasn't stopped stateside investors from bailing on familiar Chinese names. As it stands, investing in China can be a risky game. Most individual investors have no experience in the world's largest nation, and it's impossible to understand what role the country's communist leaders could play in the future. The most prudent way forward -- especially for beginning investors -- is to wait for the dust to settle. But once it does, our analysts think that you should check out shares of two very interesting Chinese companies. The first is often referred to as the "Google of China", Baidu (NASDAQ:BIDU). The other you probably haven't heard of: online car portal Bitauto (NYSE:BITA). Joe Tenebruso: Stock market carnage can often unearth compelling new investment opportunities. The stocks of even the best businesses can be pummeled by indiscriminate selling, resulting in attractive prices for patient, long-term investors. Today, we have one such opportunity with China's leading search engine, Baidu. After rebounding sharply from its September lows, Baidu's stock price has been dragged down along with China's plunging stock market. Baidu's leadership of the Chinese Internet search arena is well secured, particularly in mobile search, where analyst estimates for Baidu's market share range as high as 91%. t's an enviable position, with China's mobile Internet advertising industry set to become a $33 billion market by 2018, up from only $4.5 billion in 2014. Mobile advertising revenue in China is estimated to rise sharply from RMB 30 billion in 2014 to RMB 220 billion by 2018, according to iResearch. Baidu's core search business is performing well, with both the number of its online marketing customers and the amount of spending per customer growing nicely in recent quarters. Along with the increasing base, customers are spending more to advertise on Baidu Yet Baidu is also investing aggressively in ancillary businesses, such as online banking, insurance, and food delivery. These investments have weighed on Baidu's margins in recent years, but together represent a significant source of incremental revenue -- and, eventually, sizable profits -- for the search giant. With more than $11 billion in cash and investments on its balance as of the end of the third quarter, Baidu has the financial fortitude to invest heavily in both its ultra-profitable search business and high potential growth projects. In a market with more than 1.3 billion potential customers, that's an excellent position to be in -- for both Baidu and its shareholders. The New Year hasn't been kind to domestic investors, but the past seven months have been even crueler to those in China. The Shanghai Composite Index is down over 40% since last June, and many U.S.-listed companies are down that much or more during the same time frame. After working out of his apartment for four years to keep the company alive, Bin Li now owns almost 15% of shares outstanding -- a level of skin in the game that gives me confidence in his taking the long view. The company has a dominant enough position that JD.com and U.S.-based Autotrader.com have invested substantial sums in the company. The key to success will be continued capture of China's car-buying market share, and the development of the company's EasyPay platform (EP platform), which provides financing and transaction services for dealers who sign up to be a part of Bitauto. For the beginning investor, however, it might be wise to wait and see how the dust settles in China. The country is a veritable black box, and one can't be 100% confident in the information coming out of the Middle Kingdom.